This past Sunday and Monday began the Jewish month of Adar, the month in which we celebrate Purim. There are many joyous Jewish holidays but this is the only that affects the attitude of the entire month. When we hear about the anti-immigrant crackdowns that the federal government is pursuing and await the signing of a revised refugee ban it can be hard to feel that we are entering an auspicious month of joy. As we continue to search for ways to advocate for keeping our country open and welcoming, we must find moments of celebration in our work. This week at JSS we had plenty of joy when we welcomed a new refugee family to Madison from the Democratic Republic of Congo. The family of four women, two sisters who are here with two grown daughters, arrived on Tuesday. Their arrival, despite the long travel and extra night in Newark, NJ, was described by our refugee staff as joyous. The women are very happy to be here. 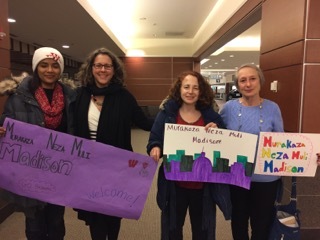 They spent their first hours in Madison enjoying lunch with JSS staff members, the family who is hosting them, and a Rwandan man who provided a home cooked meal. The man who spoke their native language offered a prayer over the meal that brought the new family to tears. In that moment of sharing food and tears of relief for finding safety and a new home, joy did indeed increase. As it says in the Book of Esther, “The month that was reversed for them from grief to joy” (Book of Esther 9:22). As you continue to support JSS’s refugee and immigration programs may you also find moments of that are transformed from grief to joy. p.s. If you have a medium size raincoat for a man or a woman, we could use them. (One of each). Please let Rihab know at rihab@jssmadison.org. A big thank you to Hadassah’s Collectors Corner for graciously providing warm and comfortable clothes for our new refugee family. They were so incredibly helpful. Todah rabah! We received a generous donation from 5th Element Coffee for the work JSS is doing with refugees and immigrants. Next Next post: Be a Volunteer for a Community Seder!